Should I Have an Irrigation System Installed This Spring? 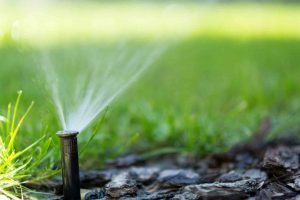 Ensure a beautiful spring landscape with an irrigation system. April showers may bring May flowers, but will there be enough rain to sustain your landscape all season long? Residential landscapes large and small are in desperate need of irrigation and drainage systems to maintain the health and beauty of grass and plants. Are you thinking about installing an irrigation system this spring? Discover why that may be the best choice you could make for your property. Not only is hand watering an inefficient use of your time, but it also can be extremely wasteful. Irrigation systems operate on a timer system, and they’re preset to release only an adequate amount of water during each session. Your plants, grass, and trees will receive the appropriate level of nutrients, and your water bill with decrease as a result! Specialized irrigation systems water specific areas instead of covering the entire landscape. Not only does this method provide better efficiency, but it also ensures that surrounding weeds aren’t given nutrients to grow and germinate. Irrigation systems also direct the water towards a plant’s root, rather than the leaves. Minimizing weeds and watering plants correctly reduces the chance of disease in your landscape. Overwatering doesn’t just cost you money, but it also causes excess runoff. Runoff forces the nutrients out of the soil and transfers them to other areas. Your plants can’t survive on inefficient nutrients, and you may have to replace them to invest in other costly landscaping services. If you enjoy gardening, it doesn’t take much for the leisurely pastime to become a bothersome chore. With an irrigation system, you can forget about maintenance and focus on other fun activities like planting and pruning! Your Project Loan Can Help You With All Your Home Improvement Needs! We offer a vast array of loan services, just for you. You’ll never need to worry about paying too much out of pocket for your home improvement projects, and you can start working on your home improvements immediately. We also are partnered with the best dealers in the area, so you’ll be supported throughout your entire project. We know that repairs like these are urgent matters, that is why we offer a nearly instant loan decision once you fill out our 60-second loan inquiry! We conduct business in all 50 states* and our rates start as low as 4.5%* and terms go up to 15 years! HFS Financial can help you find financing up to $200k* for your project! What are you waiting for? See your options today! This entry was posted on Friday, March 16th, 2018	at 12:39 pm	. You can follow any responses to this entry through the RSS 2.0	feed. Both comments and pings are currently closed.